at the Wimbledon Piazza (outside Morrisons), The Broadway, Wimbledon, SW19 1QB in aid of the BBC Children in Need appeal. 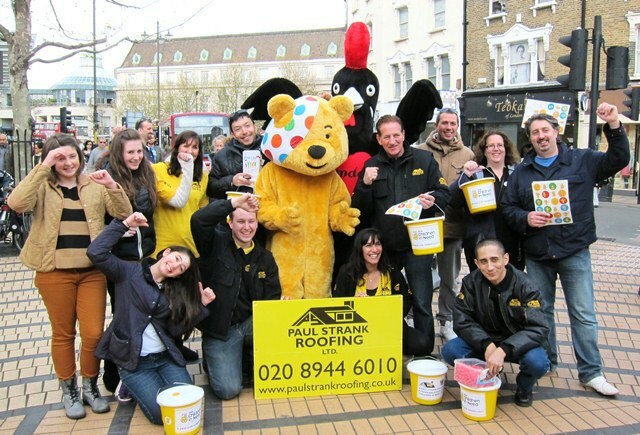 On Saturday 14th April, London’s favourite Roofing company, Paul Strank Roofing, were out in force once again on the streets of Wimbledon to raise funds and awareness for BBC Children in Need. Members of the public were invited to come along and participate in a day of fun on the Wimbledon Piazza and enjoy Nandos chicken, face painting and Live Music courtesy of the One Life charity DJs Wayne & Mete and meet Pudsey the Bear. The day raised a total £610.90 of Children in Need. Thank you to everyone who participated and contributed!